The average used Class 8 vehicle in December sold for a higher price, had less mileage and was slightly newer compared with a year earlier, according to ACT Research Co.
Amid those improvements, issues with aftertreatment systems in certain used trucks and the high cost of general maintenance persist, other experts said. Sales eased some for the year, however, slipping about 2% from 2016. The average price in December climbed 6% to $43,192, compared with $40,478 in the year-ago period. Year-over-year, mileage fell 5% to 426,000 compared with 448,000 in December a year earlier. The average Class 8’s age was 6 years, 11 months. A year earlier, it was 7 years. ACT estimated sales for December slipped 9% to 21,000 compared with 23,000 a year earlier, which included two more sales days than the 2017 period. ACT’s sales estimate is based on its sample of dealers, wholesalers and auctioneers. “The bottom line for the smaller companies and owner-operators is, the equipment they have the opportunity to buy today in the secondary market is the best quality, the youngest, the lowest miles ever and at a very attractive price,” ACT Vice President Steve Tam told Transport Topics. Throw in the growth in freight demand, the rise in freight rates and tight hauling capacity, and “there is just not a lot of reasons not to buy, not to modernize, not to upgrade. There are a lot of giddy truckers out there,” he added. “December was probably one of the best Decembers that I can remember, and for most of the dealers I deal with. That is really odd, because usually December tanks right before the holidays,” said Rick Clark, president of National Truck Protection, which offers warranties and extended service contracts on used trucks, among other vehicles. Clark also is president of the Used Truck Association. For the year, Used Class 8 sales totaled 267,900, down about 2% from 275,000 in 2016, according to ACT’s estimate. The average price for the full year was $40,478, down 5% from $42,431 in 2016. Even though prices were not able to increase on a full-year basis, stabilization and depreciation rates have returned to a somewhat more normal level, Tam said. A typical truck experiences anywhere from 1-2% depreciation in price per month. So a normal year would be somewhere around 10-12%, he said. “We were digging ourselves out of a little bit of a hole, at least for part of the year,” he said. For example, at the end of 2016, prices were down 12%. 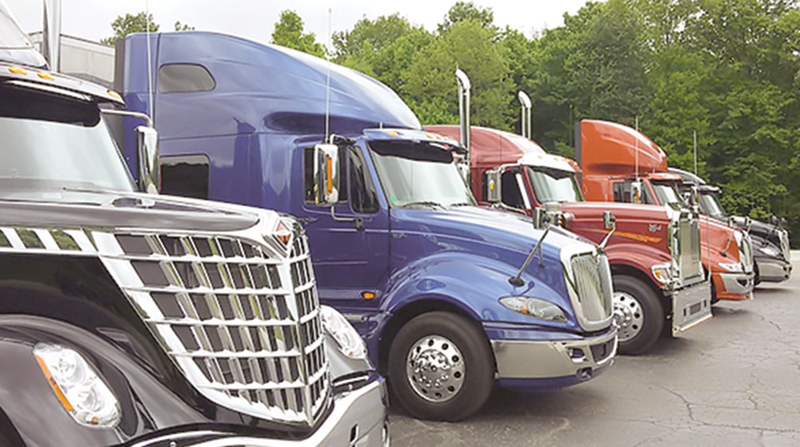 At the same time, aftertreatment systems, including particulate filters and diesel oxidation catalysts, are expensive to maintain, said Chris Brady, the principal at Commercial Motor Vehicle Consulting. “If there are problems, you are going to have clogged filters. Also, the sensors need to be replaced. But I don’t see anyway around it unless you are going to operate an older truck without that system,” Brady said. But it even reaches into the early 2010, 2011 and 2012 models. “It took a while to get the bugs worked out there, too,” Tam said. Also, the cost to repair used vehicles is steep, Clark said. “The expense of parts and labor is unbelievable these days. I’ve seen labor rates as high as $168 an hour, “ he said. That can add up. For instance, the highest price he has seen to replace a blown cylinder head gasket is $6,200. Meanwhile, one financial analyst surveyed International truck dealers on used-truck demand and found them more optimistic than not. “About 55% of dealers reported that used-truck demand has increased at their dealership since the third quarter,” Neil Frohnapple, director of equity research for The Buckingham Research Group, wrote in note to investors that discussed the results of his recent survey of International dealers. Another 25% indicated demand is similar to third-quarter levels, and 20% noted that demand for used trucks has decreased since the third quarter of 2017. “Notably, some dealers that we spoke with revealed that their dealership does not have enough used-truck inventory to meet higher demand for late-model trucks,” Frohnapple wrote.